Bimini has three islands, North Bimini, South Bimini, and East Bimini. The largest islands are North Bimini and South Bimini. The District of Bimini also includes Cay Sal Bank, more than 100 km (60 mi) further south, which is geographically not a part of the Bimini Islands but a separate unit. North Bimini is about 11 km (7 mi) long and 200 m (700 ft) wide. Its main settlement is Alice Town, a collection of shops, restaurants, and bars on a road known as "The King's Highway". The second major road is called Queens Highway and runs almost the length of the island parallel to Kings Highway. South Bimini (pop. 182) houses an airstrip, South Bimini Airport, and offers a quiet alternative to the slow bustle of North Bimini. 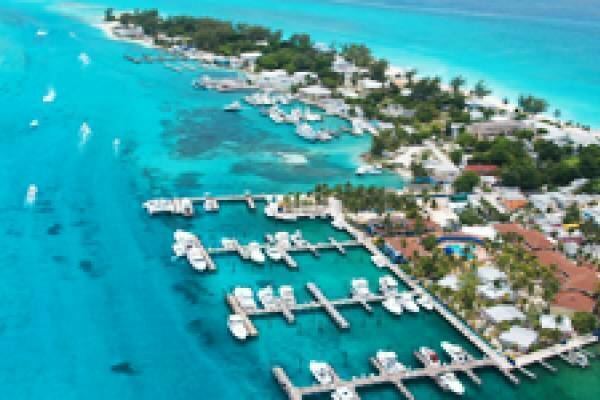 There is a small community of homes on South Bimini known as Port Royale. For many years, South Bimini tourists were limited to boaters because there were few accommodations other than private homes. The ocean surrounding the islands is considered to be one of the world's top big-game fishing spots. Because Bimini is close to Miami, Florida, many American anglers go to the islands by boat to fish or to enjoy the local nightlife. Scuba diving and snorkeling are also popular activities, as there are many shipwrecks in the area, such as the wreck of the SS Sapona, which ran aground in 1926 during a hurricane. The top of the ship is exposed to the air while the bottom half is submerged. Parts of the wreck were stripped over the years and some of the wood was used in the construction of the Compleat Angler Hotel and bar on North Bimini. Bimini is home to several landmarks said to contain mystical properties of obscure origins. Much of the historical data about these places is speculative in nature, and experts in various fields have opined across the full spectrum of explanation. The most contentious of these sites is The Bimini Road. The first inhabitants on the island were the Lucayans, and the name "Bimini" means "two islands" in the Lucayan language. During the period of Prohibition in the United States, Bimini was a favorite haven and supply point for the rum-running trade. Some claim that the term "the real McCoy" was applied to the rum provided by William S. McCoy, who used Bimini to transport whiskey to America during the Prohibition, although the phrase pre-dates the Prohibition Era – it is first recorded in the US in 1908 – and the phrase is the subject of numerous fanciful folk etymologies. Chalk's International Airlines operated seaplane flights between Miami Harbor and the Bahamas from 1917, so the company was an island institution for generations. As goods on the island were expensive because of shipping costs, many locals used Chalk's flights to buy cheaper goods in Florida and take the goods to Bimini. A Grumman Turbo Mallard of Flight 101 was en route to Bimini when it crashed on December 19, 2005, killing all 18 passengers and 2 crew; at least eleven of the passengers were Bimini residents. Locals on Bimini mourned the dead. On January 13, 2006, one of the most famous establishments in Bimini, the Compleat Angler Hotel, was destroyed by fire. The bar is remembered for the photographs and memorabilia of Ernest Hemingway that lined its walls and were lost in the fire, which also took the life of owner Julian Brown. Juan Ponce de León and his search for the Fountain of Youth included references to Bimini. Arawak and/or Taíno spoke of a land called "Beimini" where the fountain could be found. Although the location was erroneously associated with the Bahamas, the natives referred to a location in the Gulf of Honduras. Though de León's expedition brought him to Florida, the fountain was rumored to exist within the shallow pools of South Bimini. Today there is a small freshwater well with a plaque commemorating the Fountain of Youth, on the road leading to the South Bimini Airport. Found within the brackish mangrove swamp that covers 6 kilometres (3 1⁄2 mi) of the shoreline of North Bimini is The Healing Hole, a pool that lies at the end of a network of winding underground tunnels. During outgoing tides, these channels pump cool, mineral-laden fresh water into the pool. Because this well was carved out of the limestone rock by ground water thousands of years ago it is especially high in calcium and magnesium. Bimini is home to several unique, endemic and threatened species. The Bimini Boa (Epicrates striatus fosteri), protected by Bahamian law, is the largest of the terrestrial reptiles on Bimini. The Bimini Ameiva (Ameiva auberi richmondi) is a very common, fast moving lizard on the island. The Smalltooth sawfish (Pristis pectinata) is one of the rarest fish in the world, sometimes listed as a critically endangered species by conservation groups. The Bimini Biological Field Station has captured and recorded 13 species of sharks in the shallow waters around Bimini. However, the number of sharks around the island is even higher when considering the sharks of the deep waters off Bimini's western shores. Along with the species featured below, the BBFS has witnessed and recorded captures of Shortfin Mako sharks (Isurus oxyrinchus), Bigeye Thresher sharks (Alopias superciliosus), Spiny Dogfish (Squalus acanthias), and Sixgill Sharks (Hexanchus sp.). The Shark Lab is a world-famous facility owned and operated by shark biologist Dr. Samuel Gruber. The Sharklab offers marine biology internships to people interested in shark research and the conservation of the ocean's ecosystems. It's located on South Bimini Island and contributed a lot of research regarding the lemon shark. Singer Jimmy Buffett spent some time on South Bimini while writing one of his books. Ernest Hemingway lived on Bimini from 1935 to 1937, staying at the Compleat Angler Hotel. He worked on To Have and Have Not and wrote a few articles, but mostly he fished aboard his boat Pilar, trolling the deep blue offshore waters for marlin, tuna and swordfish. Hemingway was attracted to Bimini by tales of the incredible fishing available in the Gulf Stream, the legendary “river” of warm water that rushes north past the Bahamas. An Atlantic blue marlin with a mass of 500 pounds (230 kg) caught off Bimini allegedly inspired Hemingway to write The Old Man and the Sea and Islands in The Stream. The Duke of Windsor, as governor of The Bahamas during World War II, visited Bimini. While not a resident of the islands, Reverend Dr. Martin Luther King, Jr. visited in 1964 and worked on his Nobel Peace Prize acceptance speech while there. South Bimini was home to Colonel Joseph C. Mackey, the founder of Mackey Airlines, which was later bought by Eastern Airlines. He built a home on the southern tip of South Bimini. This structure would become the Sunshine Inn and is currently a bar and restaurant, though the hotel was damaged by a hurricane and was subsequently demolished. Among Port Royale's notable residents was Adam Clayton Powell, Jr., who was excluded from the U.S. House of Representatives because of allegations that he misappropriated committee funds for personal use. He stayed in Bimini from January 1967 to April 1969 in self-imposed exile until the Supreme Court ruled that the House had acted unconstitutionally when it excluded Powell, a duly elected member. In 1972 Powell died of cancer in Miami. 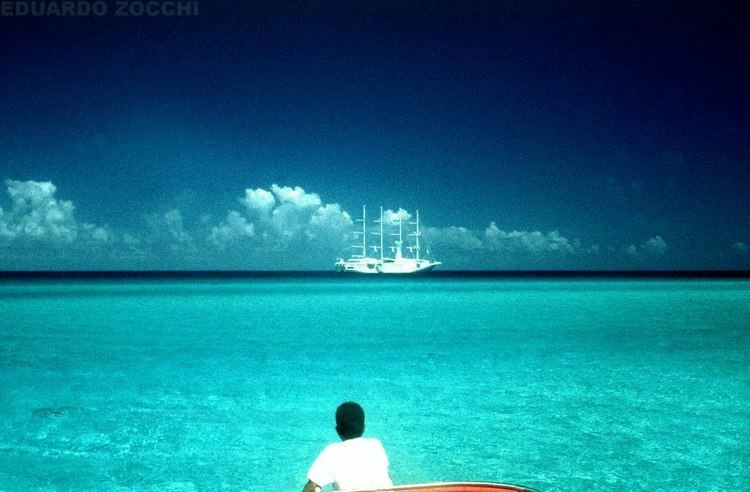 Following his funeral in New York his ashes were taken to Bimini and scattered in the waters surrounding the islands. In May 1987, Colorado Senator Gary Hart's presidential bid was derailed after media reports exposed a relationship with model Donna Rice. A well known photo of Rice sitting on Hart's lap on one of Bimini's docks was published by the National Enquirer after Hart suspended his presidential campaign. Jody Weech, Miss Commonwealth Bahamas 1992, was from Bimini. She made the Top 10 in the Miss World contest in Sun City, South Africa. She received the title Miss World Caribbean. In May 2008 marine conservationist Jean-Michel Cousteau criticized Bimini Bay Resort, calling it a "catastrophe" and announcing, "allowing Bimini Bay to continue with phase II would certainly strip this island paradise of its precious natural riches. Over time, visitors and residents alike will suffer the decline of economic, social and environmental prosperity..."